The New York Post is reporting that the New York Giants did not offer Mike Singletary a contract after he interviewed with the team on Thursday for the vacant linebacker coach position. The Post says the Giants will continue to interview other candidates. 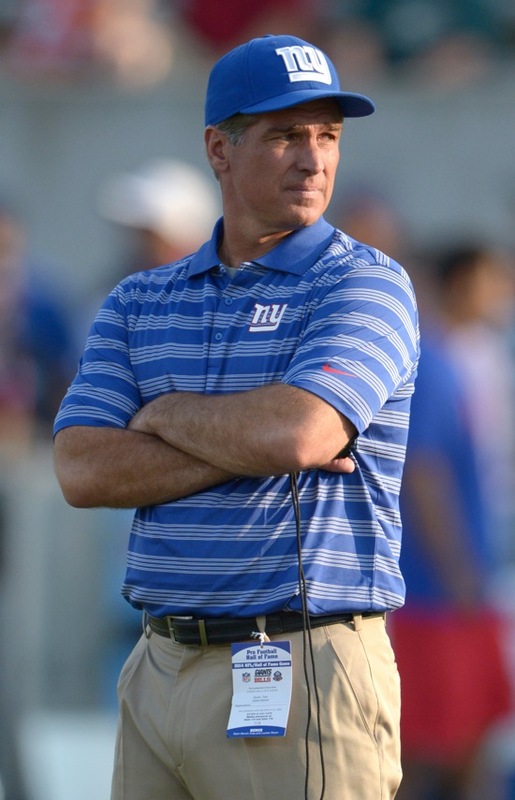 Jim Herrmann had been the New York Giants’ linebacker coach since 2009. The team allowed Herrmann to interview with other clubs after the season, and he accepted the linebacker coach position with the Indianapolis Colts last week. The 57-year old Singletary was a Hall of Fame linebacker for the Chicago Bears (1981-1992), twice NFL Defensive Player of the Year, eight-time first-team All-Pro, and a 10-time Pro Bowler. Singletary was head coach of the San Francisco 49ers in 2009-2010. 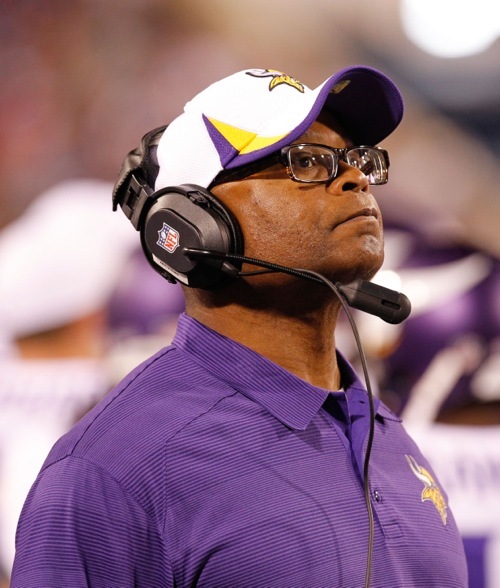 He served as assistant head coach and linebackers coach of the Minnesota Vikings in 2011-2013. Singletary has not coached for the last two seasons. The San Francisco 49ers have hired Pat Flaherty as their new offensive line coach. Flaherty had served as the offensive line coach of the New York Giants since 2004. According to multiple media reports, the Giants were not interested in retaining him in 2016. Though not officially confirmed, the Giants have hired Mike Solari as the team’s new offensive line coach. The Cleveland Browns have hired Robert Nunn as their new defensive line coach. Nunn had served as the defensive line coach of the New York Giants since 2010. According to multiple media reports, the Giants were not interested in retaining him in 2016. The team’s defensive line coaching position currently remains vacant. According ESPN Radio out of Philadelphia, the New York Giants have denied the Philadelphia Eagles permission to talk to Steve Spagnuolo about the Eagles’ vacant defensive coordinator position. 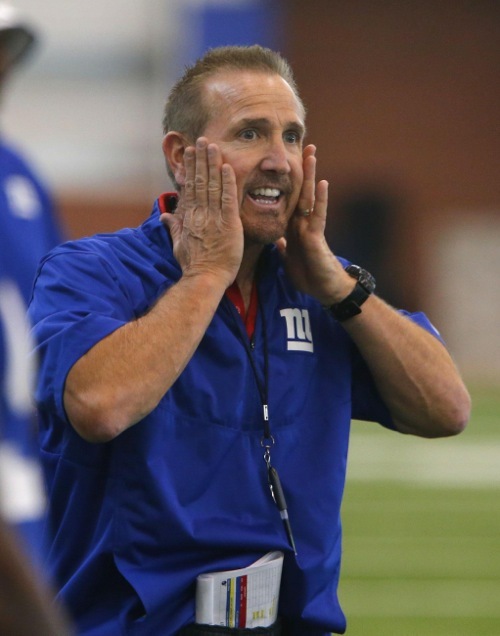 Although there is no official word from the Giants, ESPN and The New York Post are reporting that Spagnuolo will remain the team’s defensive coordinator in 2016, despite the fact that his defense finished dead last in the NFL in 2015. Eagles explored idea of bringing Steve Spagnuolo to Philly as DC, but he now is expected to remain with New York Giants, per league source. 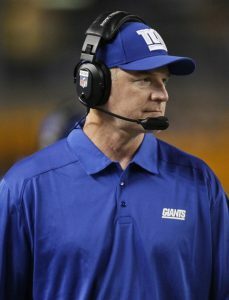 According to FOXSports and NJ.com, the New York Giants have decided to not retain Offensive Line Coach Pat Flaherty, Defensive Line Coach Robert Nunn, and Strength and Conditioning Coach Jerry Palmieri. NJ.com says Palmieri could be reassigned to a lesser role. 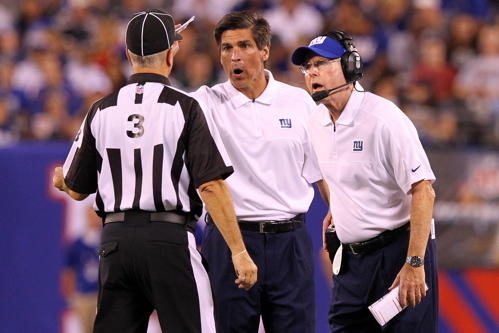 Flaherty and Palmieri have been with the Giants since 2004 when Tom Coughlin was hired as head coach. Nunn has been with the team since 2010. He will apparently be interviewing for the same position with the Tennessee Titans. Other position coaches to leave the Giants this offseason include Wide Receivers Coach Sean Ryan, Linebackers Coach Jim Herrmann, and Assistant Special Teams Coach Larry Izzo. Ryan and Izzo are now with the Houston Texans and Herrmann is with the Indianapolis Colts. According to FOXSports, Frank Cignetti, Jr. is “in the mix” for the quarterbacks coaching position on the New York Giants. That position was held by Mike Sullivan in 2015, but there are reports that Sullivan will be promoted to the team’s vacant offensive coordinator position. The 50-year old Cignetti has been with the St. Louis Rams for the last four years, first as quarterbacks coach (2012-2014) and then offensive coordinator (2015). Cignetti was fired by the Rams in December. As expected, New York Giants defensive end Jason Pierre-Paul had additional surgery on his permanently-damaged right hand on Monday. Pierre-Paul suffered catastrophic injuries to his hand during a July 4th fireworks accident, leading to the amputation of his index finger and severe damage to his middle finger and thumb. Pierre-Paul played in eight games in 2015 and finished the season with 26 tackles, one sack, and six pass defenses. New York Giants wide receiver Odell Beckham, Jr. has been voted to the Pro Football Writers of America All-NFC team. Beckham was the only Giant to make the team. Beckham played in 15 games in 2015, and finished the season with 96 catches for 1,450 yards (15.1 yards per catch) and 13 touchdowns. He was also voted to the Pro Bowl. The New York Giants held their seventh summer training camp practice on Friday at Quest Diagnostics Training Center in East Rutherford, New Jersey. The full training camp schedule is available at Giants.com. The New York Giants have signed rookie free agent Justin Halley (Florida International) and waived/injured wide receiver Chris Harper. Right guard Geoff Schwartz (coming off of ankle surgery), left tackle Will Beatty (PUP – recovering from pectoral surgery), linebacker Jameel McClain (neck), and safety Nat Berhe (calf) did not practice. Cornerback Prince Amukamara (groin) was limited. Today’s practice was only a jog-thru. “The purpose is we went two hard [practices] in a row and we have a hard one tomorrow, so this would be the natural down curve and we thought this was the time to go with a mental day, a learning day, rather than anything physical so we can get something done tomorrow,” said Head Coach Tom Coughlin. 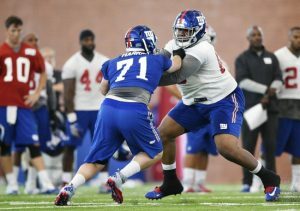 With Geoff Schwartz out, the starting offensive line was left tackle Ereck Flowers, left guard Justin Pugh, center Weston Richburg, right guard John Jerry, and right tackle Marshall Newhouse. Landon Collins and Jeromy Miles were the starters at safety. 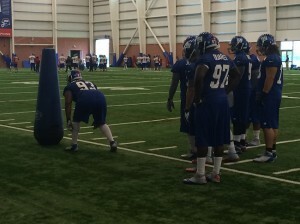 Dominique Hamilton received some reps with the first-team at defensive tackle alongside Johnathan Hankins. The first-team defensive ends were Owamagbe Odighizuwa and Robert Ayers. Jordan Stanton also saw some time with the starters at right defensive end and inside as a pass rusher. Shane Vereen and Rashad Jennings worked with first-team today; Andre Williams worked with the second-team. At one point Victor Cruz motioned into the backfield and lined up at tailback. Q: What was purpose of this practice? A: The purpose is we went two hard [practices] in a row and we have a hard one tomorrow, so this would be the natural down curve and we thought this was the time to go with a mental day, a learning day, rather than anything physical so we can get something done tomorrow. Q: You’re hurting your reputation a little bit here running games and easing down here? A: A new, changed scientific approach. Q: Any updates on Jameel McClain? A: No, he will be a while. Q: Is there something structural there? A herniated disk on McClain? A: No, but he has had some issues in the past and they are trying to rule out a bunch of things. I’m not going to rush a guy back in, forget that stuff. It is just like a head [injury], we aren’t going to rush anyone back in who has an injury like that. Q: Is it his neck or his back or his spine? A: It is in that area, I think. Q: You haven’t been asked in a while. Have you spoken to Jason Pierre-Paul yet? A: No, but I think I will speak to him [shortly]. A: I have not talked to him yet, but I am anticipating talking to him perhaps before the end of the week. A: I just have a premonition. So far my premonitions, none of them have worked. Q: What do you think that conversation will be like? A: If and when it happens, I am concerned about knowing how he feels. Where is he? How is he coming along? I won’t even ask about the extent of the injuries but I’ll let him tell me. Why isn’t he here? Q: Richburg and Flowers obviously feeling good enough to be out there today; I know you didn’t go hard. Do you anticipate them being out there tomorrow? A: I hope so. They are not going to get the full green light. They are going to be restricted, but I’m thinking they will be out there. Q: I didn’t see Odell out there at all. Was there something to that? A: No, nothing to that. Q: What was your reaction to Shaun O’Hara’s comments? A: I don’t have any reaction. I am not going to comment on that. Q: Any update on Geoff Schwartz? Q: Will you bring everyone to Cincinnati? Even guys who aren’t going to participate? A: No, but they have to be ruled out of the game not to go. They may be ‘can’t work today but we’ll see’ kind of people and they will come. Q: Do you have to prepare any differently even with the practices maybe than you would with the first preseason game because you are going out there and going against a [different] offense or defense? A: That is the purpose. The purpose is to go and get good, hard work against someone else instead of beating on your own people. Q: Do you think Victor is a no-go for that first game? A: Probably, but again — ask me next week in the middle of the preparation for the game. Q: But he will come with you? A: Ask me next week after I get there. Pat Flaherty addressed the media on Monday (video is available at Giants.com). Q: I know you really can’t control it, but the level of frustration when you look and see three projected starters on the side yesterday, how frustrating is that? A: I don’t think it’s frustrating. I probably have my feelings go towards those guys because I think, I believe, they want to be out there and they can’t be out there for various reasons because they’re injured. My feelings of whatever I have is really for those guys that they want to be out there and get better. As a group, we need them out there to get better. There are some things as a coach that you can control, there are some things you can’t control. The one thing that I always want to stay focused on as a coach is do the best job with what we have to work with and what I can control. That’s the players out there practicing at the moment. Q: But still you can’t build continuity when you have guys coming in and out. How do you comb that over, if you comb that over? A: You try to do it with the things that those guys can do, whether it’s walk-throughs, in the meetings, trying to keep that continuity. You’re not getting 100 percent, as you mentioned, you just get the best of what you can do, whether it’s sitting in a chair and talking about things and letting them call things out in the meeting rooms. We try to keep that exercise going each and every day. Q: Where do you stand at right tackle at this point? I saw the other day you rotated Newhouse and Schwartz..
A: We just want to make sure that we get guys working at various positions because if something else happens at a position, you want to be able to say, ‘Okay, we’re going to do this.’ So we’re going to let guys work at positions and see how they do and one of them was Geoff at the time. Now he’s not totally healthy right now so for him to go out there for Marshall really is not the best indication we can get at this point, but we’ll continue to work with that. So right now, Marshall Newhouse is the starting right tackle and we will have other options. I think the more competition you develop, and that’s what we’re trying to do as the New York Giant offensive line, which we’re going to also get a starting five and always have competition right nipping at their heels. I know we’ve used a term here ‘the next guy up’ but, really, what that means is you’re ready to take over because you’re pushing the starter. Q: Prior to the injury bug starting, Justin (Pugh) and Weston (Richburg) spoke about being tougher, being like that 2008 line. Are you seeing that from them yet? A: Yeah, I’m seeing that. You can’t—we have a saying in our offensive line room and I’ll share it with you, “We talk with our pads.” I know they are sharing that with you, I heard that before and that’s fine, but it’s not going to get done just verbally talking about it. You have to do it with pads. One thing I have seen each and every day by these guys is they are coming off the ball better with their pads. We always have to work on our leverage on our pads and if we continue to progress like that, we are going to be a good offensive line. We are talented enough. I know sometimes we question that, but we are talented enough. Whether or not we do it, I’m part of that equation as a coach. Q: How is Brandon Mosley coming along? I see him getting worked into the mix. A: He is out there at tackle now. We are trying to keep him in one spot. We moved him and worked a couple reps at the guard position and it is a little bit different out there at tackle in terms of the pass protection, so he is getting a feel for that with his technique, he has some work to do. Q: Missed practices at this time of the year, what do they mean, especially for Flowers? A: Well, it is critical, it is. It is nothing that you take lightly with a young player. The only guys that you would actually kind of, as a coach, breathe okay with is a guy that is a veteran, a guy that has played year after year after year. A young player needs every snap that he gets, so my job is when he’s not in there, in particular in our jog-throughs and walk-throughs, is he’s right beside me and he’s telling me his assignment so he’s getting mental reps. Mental reps aren’t going to get the job done, you have to get out there and physically do it. Obviously, right now he can’t physically do it, so we’re going to do whatever we can to keep getting him ready to play. Q: Do you have a sense on when you will get Flowers and Richburg? A: No, I don’t. I think Ronnie (Barnes) can answer that. If you ask me, I’d say my fingers were crossed for today, but that’s asking me. I have no idea. I’m just hoping that the guys get back sooner than later but when you get them back you don’t want that reoccurring. Ereck is a little different now. He wants to—he’s chomping at the bit, he’s in my ear, and I say, ‘Hey, listen, you’ve got to understand we have the best training staff in the world.’ And I said, ‘They’re going to put you out there when you’re ready so you don’t re-injure it.’ It’s no good to get out there and then go back to square one now. So he’s missing some time now but the objective is when he gets out there, he’s not looking back, he’s going straight ahead. So when that is, I really couldn’t tell you. Q: Were you aware of the tweets by Shaun O’Hara questioning the offensive linemen? A: I don’t have one of those accounts. I don’t even know if I can pronounce it but I can’t say. I’m not going to stand before you and say I don’t read your articles because I do when I have time, but when I come in the morning, and whatever time it is right now and whatever day it is, I haven’t done that. Q: Did you hear about it though? Q: He’s basically questioning the toughness, saying offensive linemen shouldn’t be sitting out practice coming off a day off basically. A: That’s one man’s opinion from that standpoint. When you get into the inner circles and really into our organization and all the discussion we have with Coach Coughlin each and every day from head coach to assistant coach, I don’t question the toughness because I know and I understand what they’re going through. Now I don’t know what Shaun’s saying, but maybe he’s saying, ‘Hey, listen. Sometimes if you have a little bit of soreness, you have to play through it,’ but that’s different. These guys don’t have that, they have an injury and that’s why they’re not practicing. One thing in training camp that I know is in Shaun’s back of the mind because we’ve always talked about it in our room with all those guys, you have to develop the calluses on your hands, you have to develop the soreness with the pads and next is going to be a little stiffness and all those things that come with playing this game that they love to play. If they don’t love to play it, okay we’re missing the boat there somewhere. That’s what you have to be able to do —you do have to work through some hurts and some pains, you do. The injuries, that’s totally different. That’s controlled. So whatever the opinion is, mine is if they’re injured and they’re hurt, my job is to make sure they get the mental reps.
Q: (O’Hara’s) around here a lot, though. How much is he in the guys’ ears in regards to..? A: That’s a great question. I think all those guys—first of all, whether it’s Shaun or Richie (Seubert) or Chris (Snee), they love the New York Giants. You guys have heard it before, once a Giant, always a Giant and those guys are going to do everything they can to help this organization, whether it’s with players or outside talking to the fans, whatever it is. I’m sure they’re going to—the one thing I’ve always, as a coach, told the younger guys is reach out to the veterans, watch them, absorb everything you can, see what kind of passion they have because the true veterans have been through it. The veterans are going to reach out to the retired guys possibly from that standpoint. Robert Nunn addressed the media on Monday (video is available at Giants.com). Q: What kind of correspondence have you had with DE Jason Pierre-Paul? I’ve spoken to him on the phone. I’ve texted him back and forth and mostly about things other than football. The first thing you know, it’s been talked about before, and it was a tragic thing that happened, major accident. Everybody has their beliefs on what happened, what should have happened, and make of it what they want to, but the guy went through a tough thing. It was a tough situation to be in so when I talk to him we talk more about where he is from a mental standpoint. I texted him back and forth, just to let him know that we’re here for him. Whatever he needs, we’re here for him, and his response has been, “Coach, I’m good, I want to get myself right, and I’ll be back.” That’s kind of where it stands. I don’t know any more than what you guys know from that standpoint. Most of my conversations with him have been about things other than football. Q: Do you have any idea on when to expect Pierre-Paul? No. Everybody is guessing. Nobody knows right now, and he texted me just this morning to tell he’s good today. I kind of keep up with him like that. Every day or every other day I’ll shoot something at him with text. Again, it’s all usually about something other than football. We talked about we miss him in meetings and busting his chops in meetings and we kind of laugh about it. That’s kind of where it goes. I don’t know any more than that. Q: How do you balance the confidentiality established with Pierre-Paul and sharing information with the organization? Jerry (Reese) and I talk almost daily when I talk to him. If he (Pierre-Paul) asks me not talk about it, I don’t talk about it, but we don’t really get into that. It’s not anything everyone knows, you know. I just want to know where he is from an emotional and mental standpoint, and we’ve told him, everybody in this building has told him, we’re here for him. Whatever you need, just let us know how we can help, and so that’s been the conversation, but there’s really not any more to it other than that. He shoots me a funny text every so often and I’ll shoot one back. Some of the guys have talked to him, I think, and texted him about the meetings and we have some laughs. He’s not here to defend himself when we bust his chops and so we laugh about that. It’s that kind of conversation. Q: Do you have to prepare as if you have to move on without Pierre-Paul? We’ve talked about it in our room as far a defensive line room and that’s kind of been how it is. We’re going on and he’ll be here when he’ll be here and those other guys have a great opportunity and we’re going from there. Q: Are you at the point where you’re sending Pierre-Paul defensive information? I haven’t lately. We’ve discussed a little bit of that but I haven’t been sending a lot of stuff yet. He’s got up until the accident happened. He’s got most of everything in front of him, so when the time comes, we’ll get on it, and I’ll spend day and night doing that, and getting him ready to go. Q: Do you get the sense that Pierre-Paul misses being here? Q: Do you know the extent of Pierre-Paul’s injury and if he’ll be as effective as he once was? I don’t really know any more than what’s been printed. I told him that we’ll just tie one hand behind his back because he’s that kind of player. We joke about it a little bit like that, but I don’t know. I don’t know anything more than you guys know as far as the extent of the injury. Q: Were you expecting Pierre-Paul to have a big year? Oh yeah. He’s been an outstanding player. When he’s been healthy, he’s been as good as there is in the league and so we were all looking forward to that. Hey, it was a crazy thing that happened, but it happened. It was an accident, a horrible accident, life-changing experience, and so we’re going to move on from there and make the best of it. Q: How do you plan moving forward? Do you have to plan as if Pierre-Paul is not going to be here? Right now that’s what we’re doing as far as a group and everyone. We’re all pulling for him in that room. Everyone in there is very close and stays in touch with each other, and so we’re all pulling for him to be back, but right now we’ve got a job to do and that’s what we’re doing. Q: How do you see filling that right defensive end spot? The situation right now, as far as the defensive ends, we’ve got a group of defensive ends that have come in here with the right frame of mind, and I really feel good about the rotation. Right, left, starter, non-starter, we’ve got a good group, and we’re going to keep building every day and stacking successes. Young guys come in and are doing what we ask them to do, and I like where we are. Preseason games will tell us where we stack up as far as against other offenses, but I like where we are going into this practice here Saturday, and going to Cincinnati next week and we’ll see where we stand. Q: Do you have to tweak the defense because of the absence of Pierre-Paul? No, not necessarily. Spags (Steve Spagnuolo) has his package and we’re putting it in and we’re putting it in as best we can. We’re going to continue to tweak it and adjust it just like we would if he was here, he’s not here. No we haven’t changed very much. Q: Have any of the defensive ends jumped out at you? In certain areas they’ve all jumped out. I really like where Robert Ayers has come in from a mental standpoint. Kerry Wynn, when he got his opportunity, he made the most of it as far as production. Kerry Wynn, when the pads come on, he’s a different player than when the pads are not on, and I’ve coached players like that. Q: Does Wynn become a different player when the pads are on because of his strength? Yeah. He’s a strong, young player and they all do some things that the other ones don’t. Owa (Odighizuwa), you know we have to get him in better condition but he’s showed some good things. He’s a strong kid that wants to do what you ask him to do. Damontre (Moore) has come in and done some good things. They all have something that they can do that maybe somebody else doesn’t do. The group of defensive ends, I like where they are. George Selvie is a professional, hard-working, every day he shows up, does what you ask him to do, and that bleeds through that entire room. Q: Did (Jonathan) Hankins show you enough as a pass-rusher last year? Oh yeah. He kind of started showing up a year ago, when we would get in one-on-one pass rush, he was doing some good things, and he got his opportunity and took advantage of it. If he’s producing, he’s definitely going to be in there. He’s definitely going to have that opportunity to get in there in some rush situations. A lot of that will be controlled by down and distance. If it’s a truly long yardage situation, then Jonathan probably won’t be in there just because of what you can see. He’ll be in there, he’ll have some opportunities. Q: Why have the defensive ends been moving inside? Is it because it’s early or do you want to see what guys can do in those spots? Both, it’s early and you know we can get some of those other guys some opportunities. We’ll continue to tweak that and look at it and give everybody a shot. Q: Have you seen any early indication that you’ll be better against the run? It’s hard to tell until you get in real games. When real bullets are fired you is when find out. I know we challenged them, we’ve challenged them to come in here, and we have to be able to stop the run better than we did last year. I like where we are, Hankins has come in here in a great frame of mind, and I can’t say enough positive things about where he is. Markus Kuhn has come in and is ready to give himself a shot. Jay Bromley, the one thing I love about coaching Jay is when you give him something to work on, he works on it every day. He tries to correct it as you talk to him each day, each practice, and Kenrick Ellis, they’ve got their opportunity in front of them, so we’ll see when the real bullets fire. Q: What is it that you see in Kuhn that is giving him an opportunity? He’s got himself in that position. Markus didn’t have a lot of production last year but he still did some things that caused production. There are a lot of those times that the defensive tackles, there’s hidden productivity, now there’s also some times he has to make some plays that he should have made. That’s the thing that we talked about in the off-season, he and I did, and it’s some things that you have to improve on. He’s gotten himself ready to have that opportunity going into preseason. Q: What is different about Kuhn this year? Foot quickness, I think he’s continuously worked on that, and his agility inside and his balance. He seems to be further along than he’s ever been with the foot speed and the quickness. Markus is another one, you give him something to work on, and he’ll work on it over and over. He’s a lot of fun to coach. The first day of the New York Giants three-day mini-camp was held on Tuesday. Like the Organized Team Activity (OTA) practices, no live contact is allowed, but 7-on-7, 9-on-7, and 11-on-11 drills are permitted. Wide receiver Odell Beckham (hamstring), wide receiver Victor Cruz (recovering from knee surgery), tight end Larry Donnell (Achilles tendinitis, still in walking boot), offensive tackle Will Beatty (recovering from pectoral surgery), DE Robert Ayers (sprained ankle), DE Damontre Moore (recovering from shoulder surgery), LB Devon Kennard (hamstring), and safety Nat Berhe (calf) did not practice or fully practice. The first-team offensive line remained LT Ereck Flowers, LG Justin Pugh, OC Weston Richburg, RG Geoff Schwartz, and RT Marshall Newhouse. Brandon Mosley saw some reps at right tackle with the second team. First-team defensive ends remained George Selvie and Cullen Jenkins. Kerry Wynn, Owamagbe Odighizuwa, and Jordan Stanton saw reps at defensive end with the second team. Johnathan Hankins and Markus Kuhn remained the first-team defensive tackles. The starting linebacking corps was J.T. Thomas, Jon Beason, and Jonathan Casillas. Landon Collins and Cooper Taylor remained the first-team safeties. Manning then found RB Shane Vereen for a short touchdown reception. LB Uani’ Unga intercepted a tipped throw from QB Ryan Nassib. WR Corey Washington made a one-handed reception on a deep throw over CB Dominique Rodgers-Cromartie. CB Prince Amukamara had good coverage on a deep sideline throw to WR Geremy Davis. S Justin Currie tipped a pass intended for WR Marcus Harris and S Mykkele Thompson intercepted the deflected ball. QB Eli Manning hit WR Preston Parker down the middle of the field for a touchdown. Q: Any difference for you for what you do in OTAs versus mini-camp? A: Not really. What you do is you have a 10-day series of objectives and you get to the camp and you revitalize your objectives. Present it as we did this morning to the players and talk about how important these three days are and what they lead up to. Set a theme whereby you jump on that again on Thursday afternoon. Q: It looked like the defense was playing a lot better today… Are they progressing according to schedule or is there even a schedule? A: Sure, there is a schedule. They have had a whole lot thrown at them and they have done decently with it. They worked didn’t work as good as at the end of last week and that is probably why you saw better here today. 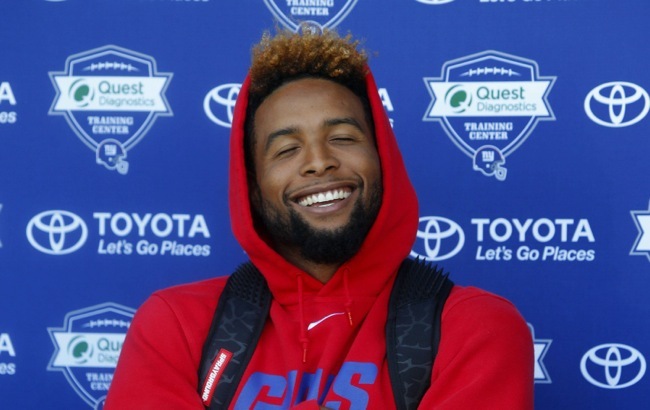 Q: Is Odell [Beckham Jr.] just not going to do anything this week? A: I don’t think so, but he was running around on the field out there. He seemed to be doing okay. Q: Is it hard to get a bead on what you have here with three of your best players not participating with Odell, Victor Cruz and Jason Pierre-Paul? A: Is that one of those rhetorical questions? Yes. I mean, I can see what we can do. At least I got to see Odell for a while, but there is no doubt. You have a lot of timing involved. You have a two-minute drill you are trying to time things up. You are trying to create some – ball gets out the quarterback hands quickly. I don’t know exactly what the issue was here today, but the offense wasn’t very good in the two minutes. 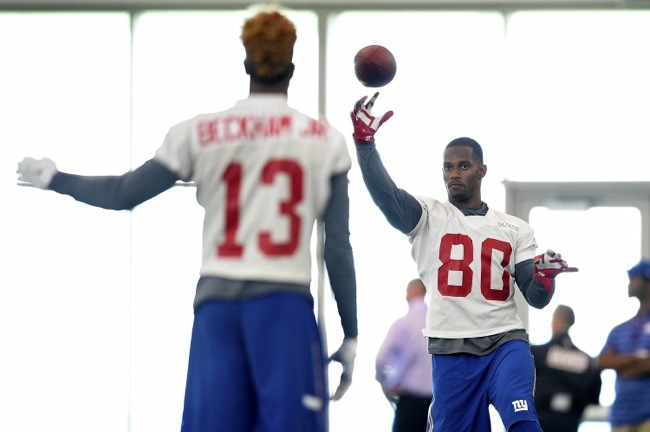 Q: Do you play it safer with Odell for the purpose of this being a June mini-camp? A: No, whatever the medical people tell me is what we do. If he could go, he would be out there. Q: [Defensive Line Coach Robert] Nunn was saying he has had contact with JPP and senses he is up to speed as much as he can be without being here… Do you have a sense of security…? A: All I know is that he is not here. That is all I know. He has been here for a couple of days. He spent a couple days in the classroom. He seemed to do well with the information that was given up to that point, but since he has left, he obviously has received nothing. All I know is that he is not here. Q: Can you comment on the Stony Brook guys? A: They are no doubt happy to be here. They are working hard. There is an awful lot of stuff. Michael [Bamiro] has been around a little bit, so he has grasped what we are doing a little quicker. We are getting some things done with the other guy. Will [Tye] is doing okay. Q: You had Bamiro at guard a little bit today? A: He has been playing some guard. Either way. Q: You have been moving the linemen around whether it is between guard or tackle? A: Normal for this time of year. Probably for training camp, too. Q: Is it just to see what the best fit for guys is? A: [It is to] make sure they well versed in playing whatever position we put them at. We are looking for versatility. We are looking for combinations. 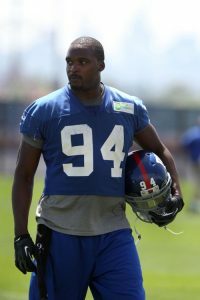 Q: What is Devon Kennard’s status? A: He warmed up and did some things. It is a hamstring. Q: Having gone through the hamstring with Odell, does it change at all? Are you doing anything differently? A: We approach it the same way, but we don’t have our head in the sand. We know the guy has an issue. I think the training room is well aware of that. Q: Why not keep him inside? What is the thinking behind that? A: He works with the trainers. He does some work on the side. He jumps over there and gets on the JUGS machine. Plus, why have him inside when the football is out here. He can absorb information based on the fact that he knows the play. Sees the coverage, knows what the reaction should be and benefits from the corrections. That is why he is out here. It has been great to be here. I can’t remember the last time we spoke. It might have been during Phase 2 or OTA’s, but it is great to get out on the field with the guys. That is when you get a true feel for what you have, where you are at and where you are going. We are in the middle of that and I look forward to continuing it. The way Coach has it structured the next three days I think will be exciting for us and hopefully when it is all said and done, we feel real good. Q: Do you have a better handle on what your roster is and the talent on it? A: I think better than when we began. I think I have mentioned this before; it won’t be until we get to the third day of training camp that we play real football. We can tell a certain number of things to a certain point in these practices. Certainly from the chin to the hairline if people are getting it. We say we are evaluating everybody on their ability to learn, which we can get a feel for that. Footwork you can get a feel for and hand placement and things like that defensively. I was talking about this with the D-line this morning – footwork is different when you don’t have any protection and pads on than when you are pressing up against people and doing the things you need to do when you have pads on. It is an ebb and flow. It is a 50/50, but do I have a better feel than I did two months ago, yeah. The answer to that would be yes. Q: Have you had much contact with Jason [Pierre-Paul]? A: Yeah. Not as much contact as I would like, but he is doing well. What is really hard when you come in new and you have a player in that situation is you want to start a rapport and a relationship, coach-player, and friendship. It makes it a little bit difficult, but we have all been through this. It is part of the league. We will just keep grinding away. Q: How much will JPP’s absence put him behind? A: He is going to be behind because there is a lot we are doing right now, but he had been around for a period of time. He did a little bit of the mental work, which I greatly appreciated. I thought that spoke volumes to who he is and what he is about and how important it is to him. Because it is new – terminology is big in this league on both sides of the ball. Hopefully he is up to that challenge and we can get up to speed real quick. Q: Do you consider JPP an elite pass rusher? A: He looks pretty elite to me. The simple answer to that would be yes. Anybody can put a highlight film together and make a play look great. If you just watch tape with JPP out there, it is evident to me that he is an elite defensive end and fits a 4-3 system, which is exciting. Q: Would you like this to be a more aggressive Giants defense than what you have seen in previous years? A: I am not going back or passing judgment on any years. I think we all can agree in here that if you are going to be good on defense, it needs to be aggressive. If you look around the league – I was very fortunate to be a part of one the past two years down south on I-95 [Baltimore Ravens] that is aggressive and physical. I think all good defenses in this league function that way. We would like to get to that point as well. How and when and where we will get with all that, we will see as we go. It is pretty tough to stress physical when you can’t really do physical out on the field. I think the mindset is there, but we will just see where we are at when we get to training camp. Q: What did the experience in Baltimore do for you? A: That could take a long time, and I say that in a positive way. Early on it was a rough period for me, but it was great that first year to just sit back and communicate with [Ravens Head Coach] John [Harbaugh] on head coaching things, work with the defense, see things from just sitting back and not being involved in a lot other then recommendations. The second year being back as a position coach, sometimes I think that is good for head coaches and coordinators to do periodically. You grow to appreciate the job a position coach has to do. Being around that system, which really is pretty different than what I had been used to with [former Eagles Defensive Coordinator] Jim Johnson, here in New York, what we took to St. Louis and New Orleans, etcetera, it was nice to get a new perspective on scheme. I am talking more about base defense than sub-defense. [Baltimore] is in what they say is a 3-4, but it is more of an under scheme. We will pick apart what we think are the meat and the good things from that and try to add them in. If you try to do too much, it won’t be any good. I thought it was very valuable. I am indebted and thankful to the people there. [Ravens owner] Steve Bisciotti, [Ravens General Manager] Ozzie [Newsome] and certainly John, who is a close friend of mine. Q: Do you take anything from the 2007 Giants defense when guys didn’t have the light go off in regards to your system until the third game and can you apply that to this team? A: Definitely. It is a little bit of force-feeding right now. I do think it is important to be multiple in this league because offenses are multiple and you have to have an answer for certain things. There will come a point as we get closer to that first game when we are going to have to make a decision and say, ‘This is it.’ If we do too much, we become less as a unit. You are always weighing that out on either side of the ball in anything you do in this league, is the too much, ‘don’t let their mind clutter up their feet’ is one of the sayings. I will always go back on that. I did even the other places I went to. We will be careful of that. I think our guys are handling it right now. There is a ways to go. We are going to make those kinds of decisions as we go along the way here. That is why we are fortunate that we still have four preseason games. Thank God. I wish we had another one to figure all that out. That will be an important piece of it, especially early. Q: Was that a lesson you learned in 2007 about installing a new defense? A: No, we had used that a lot before. Going back to that, I will tell you this, I am not sure we had as much in then as we might have now or we did in after that. Obviously at that particular time – the one little element, I know you all remember this, my friend Michael [Strahan] wasn’t here for most of that. He was an integral part of the whole thing. [Strahan] and I have talked about that. It took a little while for him to get going, and yet when all the pieces fell together, I think we did pretty good. Q: How much do you feel like you have grown since the last time you were a defensive coordinator? A: The hope is, and I think I have said this before, we grow more in anything. It doesn’t matter whether it is coaching or life, we always grow more in adversity than we do in the good times. I believe that. Especially if you go through the right way and look back and use it the right way. I think sometimes I probably had too much experience. I had too much defense. You can have too much of that, too, so I am always careful of that. My hope is that I am better at this position than I was the first time. I guess we will find out. Q: A lot of people in your position use the word ‘humbled’ … Do you think that is appropriate for you or is there another word? A: I am probably not the right one to ask. This is how I feel about everything I have been through, especially being in this league. To me, this profession I am in and the ability to have been in is a blessing to me. I have never taken it for granted. I never thought I was anything better than just a normal person trying to work hard at a job, so I hope the ups and downs that I had been through weren’t what I needed to be humbled. That would be my hope. Whether it is true or not, I don’t know, but I do know it opens your eyes. It reveals who you are and what you are made of and the people you are around and what they mean to you and what they are able to give you through the tough times. I don’t know if humbling is the right word or not. It is an education if you use it the right way. I have spoken to people before about the past and I know this much, when you are in the middle of it, you have two choices: you can either be bitter or you can get better. I made a conscious decision in my mind to get better. I hope I have done that. Q: How do you feel about the safeties on the roster and the progress the younger guys have made? A: Young. There is youth and inexperience there. It doesn’t matter what system you are in, in my opinion, defensively, those two particular guys [at the safety spots] are really important. Everyone else relies on them. The quicker we can get to the other nine trusting them, the better off we will be. I am not sure we are there yet. I think it is going to be a work in progress, but we will get there. Guys can do it. That is why I wish we had another 10 OTAs. The players don’t want to hear me say that, but it would be helpful. Q: Do you feel any better about the safety position now as compared to how you did heading into the offseason program? A: Right now it is a challenge. Challenge is probably the best word. It is a challenge for our patience and our trust in them. Everyday it gets better, I can tell you that. I do think everyday there is a trust gained there from linebackers to corners and back to the safeties. Those are the guys that really need them. I think our other guys who, the non-safeties that rely on them, are doing a good job being patient and letting them try to work through it, rather than trying to overstate them or jump the gun and make the call, so to speak. I have asked them to do that and I think that is important. We have a long ways to go in my opinion. Q: What can we expect from the Giants defense this year? A: I will let you know in a couple of months. I know where you are going with it, but I am not a predication guy. I don’t make those kind of bold statements. I will say this, I believe we are getting everything out of them right now. I have no qualms with the effort and the attendance has been great. I know we are working through one issue. That part of it has been great and that is all you can ask for right now. I think I mentioned this to you before that the main focus, one of the first things I said in the meetings, was to make sure the number one goal is that we are better today than we were yesterday. I think if we live by that and able to accomplish part of that, then we will be okay. Q: Are you starting to see the identity of the defense take place after showing them the past great Giants defenses and defenders? A: A little bit. It is hard to see it until you are competing against somebody else. The idea there was that if they could embrace the tradition, the great tradition of New York Giants defense, then they could be proud of it. If you are proud of something, then you tend to protect it. It has been fun working through that. We showed, since we last talked, I can’t remember the timing of it all, but one day we did the 1986 NFC Championship Game. Then we have some other games. We were talking about this two days ago. I have saved some for training camp. We have some players we still need to put up there. To me, it is fun; look, we are all rallying around together as a unit learning things. I test them every once in a while to see if they remember. They don’t always remember. They are getting the point. They like it, too. Q: Who are your best students? A: Mark Herzlich was outstanding. I think he had typed up, ready to go the next day. I had to make sure he didn’t tell anybody else because he made it easy. He had his cheat notes and he was ready to roll. Mark was great. Q: How much of the emphasis is on stopping the run before pressure defense? A: It always comes before, in my opinion. Now we do have run-pressures, which I hope help. When you are talking about stopping the run, it does come back to the guys up front. It doesn’t matter what you draw up on the board, in my opinion. Guys up front have to do it first, then the second level behind them have to do it next, then when all else fails, you have to have guys in a position that those plays don’t become big plays. I totally understand what you are saying. It is not all about pressure and blitzing. That is not necessarily the answer. It is about fundamentals and playing good, strong, solid, physical football up front to stop the run. That will be a focus. Tough to do now when all you have protection-wise is a helmet. Q: What have you seen or heard from JPP? A: Well, obviously he is not here but I have been in touch with him and he came up here and we met with him for a few days. He has got a start of what is going to be expected when he gets here in the beginning of it and we have been in touch with him throughout and that is really all I have to say about it. Obviously we’d like to have him here, but I don’t get involved in that, but he has got some of the stuff that we dished to him when he gets back. Q: So he has a playbook and can go over it? A: Not all of it, but I have fed him some of the stuff as we’ve gone and progressed through and he was here and I met with him probably four or five times, maybe even six or seven times. We kind of implemented some of the stuff and how it is going to be introduced when we get to training camp. I thought he had a very good grasp of it when he left and when he gets here we’ll start and that is where we’ll begin. Q: Was that all at the beginning of the offseason program when you met with him? Or was it something recent with him coming into town? A: Yeah, it was right near the beginning. Q: Do you expect him to pick up sort of where he left off? At the end of the year he was playing at that JPP level. A: Yeah, you would hope so. His numbers increased there at the end. I thought he did some good things throughout but just didn’t have the numbers to show for it, and I have said that over and over, sacks are a little overrated, but his quarterback hits and his pressures, he was doing some good things. They were counting for him in a lot of different ways and he took advantage of some opportunities there at the end and got his numbers up. His tackles had to be up there in the top of the league. I don’t know where he was, but he had to be top two or three as far as the production and as far as in the run game and his pass production there at the end. I think it is just coming in healthy and in the right frame of mind and getting ready to start, he is going to be behind but that is where we will start. Q: Do you get the sense that he is going to come in with the right frame of mind? A: All of my contact with JPP has been positive. It is what it is; I don’t get involved with the business side of it. He seems to be in a very good place mentally and working out and keeping in very good shape. His weight was in a good place and so we’ll see when we begin. Q: How hard is this defense to pick up? Is that really the part that he is missing now? A: Yeah, there are wrinkles that you have got to be here to pick up and he has got to take it from the classroom to the field, but those things, we will begin in training camp and we will make it work. Q: Is there still ample time with training camp in your mind? A: Yes, if he comes in with the right frame of mind and in good shape, he will be ready to go. Q: When you are evaluating the defensive front, if it were a lesser player, it would be easy to kind of put that player out of your mind. But I would imagine when you are evaluating right now, it is the opposite; it is imagining what it will be like when he is there. Is that fair? A: Yeah, there is some of that. When we have a player that is as talented as him, he is not out there right now but the guys that are here are doing a hell of a job. They are doing exactly what we have asked them to do. Coaches told them and I have told them that we can’t get caught up in that; we don’t have anything to do with that. Who is here is going to work and they have done a good job with that. Q: When Steve Spagnuolo was here the first time, he had a heavy rotation of defensive ends that could sack the quarterback; he had Strahan, Tuck and Osi. Beyond JPP, what do you have and what do you like about what you have? A: The one issue is that some of the guys are limited right now because of injury so they haven’t been out there. We haven’t been able to evaluate that yet because some of them are not out there. The ones that are out there are doing what we ask them to do and some of that stuff that you are talking about will all take care of itself once we get into training camp, once we start out there with live bullets flying and then that will settle and take care of itself as far as the rotation and how we rotate people. Q: Where do you see Cullen Jenkins fitting in? Is he a tackle, an end or is he both? A: I think he can help us in a lot of different [ways], it all depends. We are letting him work more at end for one reason, because of numbers, but I can see him doing some more work for us out there. At his age and stage in his career, we have to take care of him and move him around a little bit. I have been very impressed with him at this point. He got the calf last year and was off to a good start but he never was the same after the calf injury. He has come in here healthy, good frame of mind and we have moved him around a little bit and will continue the next three days to move him around a little bit. We will try to take care of him during training camp and get ready to go. Q: What have you seen from some of the new guys? A: Selvie is solid, he is a solid pro. He played well last year in Dallas and he has been steady. Some of the other guys, Jay Bromley has got to continue to improve with technique, Kenrick Ellis has got to continue to improve and I think they have made the effort to do that and we have to continue that. Q: What does Markus Kuhn need to prove to you guys? A: He has got to continue to do what he is doing. He has given us some quality reps last year and I have been very impressed with him during the OTAs. The thing he has got to do is produce when we get in pads and that is the same way with Jay, Kenrick and that group right there. When we get in pads and, like I said earlier, when the live bullets start being fired, production is going to tell us a lot about who is going to be playing and how the rotation is going to work. Q: Has that been the thing with him? You have seen it maybe on the practice field but it hasn’t always translated to the live bullets? A: He needs to increase his production but we all need to do that. He is a steady hand and a very good leader in the classroom, very good leader in our room. He is a quality guy and he has got it in front of him this year, this will be a big year for him. 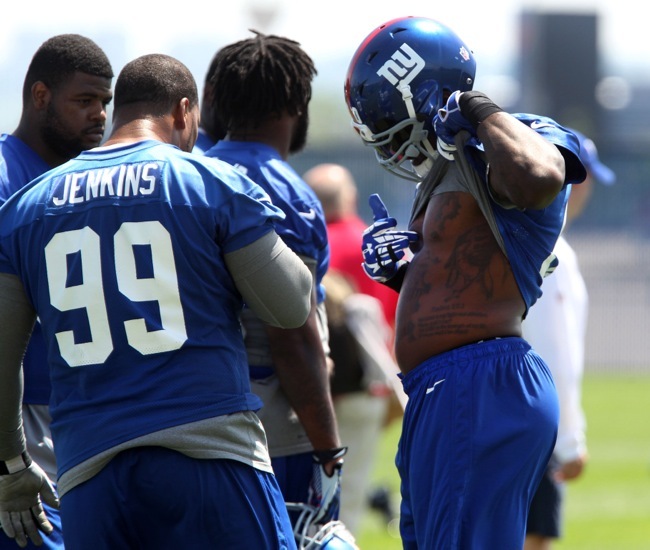 Q: How high is the ceiling for Johnathan Hankins? A: He really surprised a lot of people with his pass rush. Everybody thought that he was a run stopper coming out but those sacks were legit. He had some legit numbers and a lot of quarterback hits and pressures, came up big in some key situations and I really like where Hank is. He has got to continue to improve with technique. That is where his big improvement has got to be going into training camp but I think that it is a very good situation. He has got a chance to be a solid player for a very long time in this league. Q: Is that pass rushing ability of his something that just happens when he sees an opportunity or more when you free him up? A: I think that people underestimate him as a pass rusher. He wasn’t a great pass rusher coming out but he has really worked on a few things that have really made him effective. When they left him one on one the guy took advantage of it. When those guards have to block him one on one, he is powerful and deceivingly quick. He has got better speed and quickness than what people thing he does. Q: What have you seen so far from J.T. Thomas? A: He is very athletic. That is what I like about him. He will be a great addition to our teams. Special teams and athletically as a linebacker he can cover. He is tough. He is going to fill that role, both in base and in sub. We can do a lot of different things with him. Q: Do you see him getting any time at the middle linebacker spot or mostly weak side? A: In our base, he is an outside linebacker and in sub, we play him some in the middle. It is a very fluid deal in sub defense, so he can play in or out. 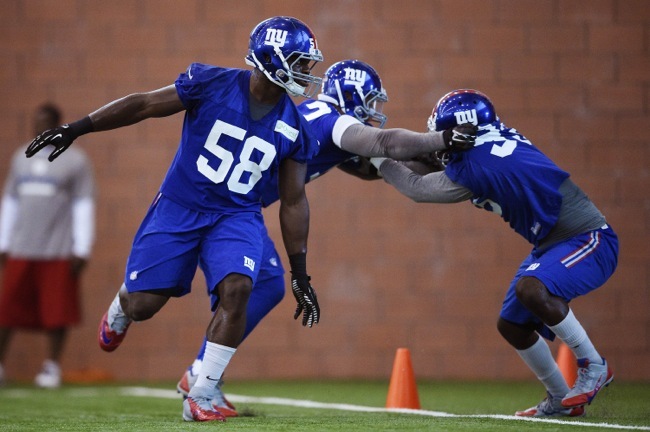 Q: What kind of improvement has Devon Kennard shown from his rookie year up until now? A: I think number one, he is more confident in himself as a player. He knows now he can play in the league. That takes you a long way. Just refining his technique and his footwork and trying to get the best of both worlds. Q: Where do you see Jameel McClain fitting in? A: I think Jameel is versatile enough. He has played all three positions, so he can play in and out. He is a tough guy, which is good, so you want him in there in the run game. He is athletic enough to play in subs. It gives us a big luxury because we have a lot of guys that have played NFL snaps and to me as a coach, that is luxury to have because a lot of times you don’t have that as a linebacker coach. It is nice to have them where you can do anything. Q: Is it possible that your three best guys might be Jon Beason, Jameel McClain and Devon Kennard, but they might not be the three best guys to have on the field at the same time? A: I think to me, when you go out, you are going to put the three best people on the field. Why would you have the best guys standing next to you? Whatever the position is… Who are the best guys? Those are the guys that are going to play. That is what the players are striving to be. They are striving to be the best three linebackers, the best four linebackers. To me, that has always been true, ever since I started coaching. The best guys are going to play, especially at the linebacker position, since they are all very similar. Q: Do you feel like the talent you have top to bottom in your group is the best you have had since you have been here? A: That is a true statement. Nothing against those other guys. I don’t want them to feel bad. Talent-wise, yes. Q: Because you can do so many things? A: Yeah, they are versatile guys and what is really nice is they are veteran guys. They have played NFL snaps. You have a lot of guys who have played a lot of snaps in football, in real games. That is good to have. Q: Without Antrel Rolle, many people are expecting Beason to be the leader of the entire defense… Do you think he is capable of doing that? A: Yeah, he is a born leader. He has always been that way since the day he got into the league. Since he was at Miami, he was a leader. I think he likes that role and he wants that role. You want a guy like that. Q: Are J.T. Thomas and Jonathan Casillas similar to you? A: They are both very athletic guys. They are different kinds of players, but they are both very athletic and can move well. You like that. It is hard right now for me because you don’t have pads on. You will find out a lot more once the pads go on. With their body of work in the NFL, they are both tough guys who can play. Q: How physical do the corners have to be in this defense? A: Well, it all depends on the coverage situation but what we try to preach is we want guys to be able to tackle [and] we need guys to be able to tackle. This league is about finding matchups and they will try and go after the weak links and guys that don’t do it, so we try to preach that we are going to have all our guys solid at tackling and being physical and getting off blocks and doing all the fundamental things that come with football, we have to get that down. Q: We know from years ago when Steve Spagnuolo was here that he has a very aggressive defense up front. Are they aggressive in the secondary, too, in a way that the corners try to attack the receivers? A: Yeah, that is the thing. The guys like it and it is fun for them to get a chance. You know how it goes, you either apply pressure or you feel it. Steve has done a great job with a history of doing things and the guys here have embraced it, they love the system and they love what he is doing. As a coach, I try to make sure that I rely on the message and rely on the techniques and be his voice of making sure we get done on the backend what he needs to get done for the defense to be successful. Q: It does seem that the more you attack and apply pressure, the more defensive players are happy? A: Yeah, and now we’ve just got to be good at executing things. Whatever he calls, that is the job on the backend. You are usually dealing with four, a lot of times five or six DBs, on the field at one time, so that is a big number of guys, so we have to be on the same page and the cohesiveness and the chemistry and all that stuff is critical to our development and our success. Q: One of the guys the last couple years has been Jayron Hosley that just seems like they are constantly trying to bring his talent out. What have you seen from Jayron? A: He has it, he has the talent. The thing we talk about is confidence. We have to make sure the confidence is there and the consistency is there and all of those things, so that the talent is showing on a daily basis. We don’t want to be up and down with it, so that is the thing we talk about and we work on, is trying to be consistent with it and getting confidence so you can play at a level that you would like to play at on a daily basis. Q: Was he a guy that you felt like you had to break down a little bit once you got here to kind of get him back to where he felt like he was on a level playing field? A: Well, everybody for me started in the same boat because they are all new to me. Even the guys that had been here and had been playing a lot, it was a new situation, there were going to be some changes and some differences on how things were. That relationship was starting from the communication and what we expect and the approach we are going to take was kind of done with everybody but with him, I know he has that talent and it was more of confidence and being able to be consistent so that we know what we are getting everyday from his body of work. Q: Do you see him as a guy who can play inside in the nickel or is he mostly an outside guy? A: He would probably be outside right now. Who knows what he may end up doing, but right now, to get confidence, you also want to start at one spot and kind of go from there and grow with it. You don’t want to throw a ton on his plate, start with one thing, let’s do that well and we’ll progress from there. Q: What about Prince can he still improve? A: Oh yeah, he definitely can improve just in techniques in general. When we play press technique, that is always a constant thing because with his talent, he is going to see different guys, he is going to see smaller receivers and bigger receivers, and you have to be able to change that up based on the guys you see and be effective with it. Also just on his ability to play fast and trying to show him to be able to see formations, see tendencies, see splits and being able to let that put you in the right position and be able to play up to his maximum potential all the time. That has a lot to do with the understanding of the situations, of formation or splits and things like that, because he has played a lot of football so he understands and those are the things that can help him grow so he can play fast all the time because he has some real talent. Q: A year ago DRC came here and the idea was he was an elite corner who would be following the best receiver. In year two, what do you sense from DRC where he is and what you guys want out of him? A: Yeah, well, he definitely has to be that guy. The thing about it that we feel good about is hopefully we have two guys that can be that and that is the confidence and level of expectation that we have is that he definitely will be that guy and a guy that has that ability, and we need to build on a consistent basis. We also feel that Prince has the ability to do that, also, and that is where we become better as a football team where we can have that with both guys because that gives you the ability that you can handle the matchups. Q: How is Landon Collins coming along? A: Good. The rookie pitfalls that they all fall into, which is thinking you can come in here and that you know it all. Then you find out you don’t know much of anything and he has a situation now that he feels the pressure. He has to make the calls and get everyone lined up and he talked a good game as far as what he had to do at Alabama and I believe that. Now when you are trying to line up grown men who have wives and children at home and they need that call from you, it is a little different than lining up a freshman. The call has to be right. Right now, he is slow to go, which was expected, but he has to pick it up quickly for us to be successful. Q: How hard is it at that position to come in as a rookie and start right away? A: I think it is extremely hard. You are the ‘the extension of the defensive coordinator.’ Whatever call comes in, you need to be able to hear the call, accept the call and then spit it back out to your fellow teammates. For a rookie to come in and have that pressure, to be the extension of the defensive coordinator, I know we have the right one doing it, but it is extremely difficult. Q: From what you have seen early on, do you think he is capable of doing that? A: I do, I really do. He is starting to realize that these missed alignments and the minus plays, I have to cut those out of my game in order for the guys around me to trust me. That is what he wants to be. He wants to be a leader. Okay, we are putting him out there. I think he is going to be ready to go, definitely, for Dallas. Q: How has Cooper Taylor come along after missing the year? A: Cooper is coming along well. Mentally, I never doubted Cooper would be able to pick up the defense. It is just now getting Cooper’s body to move in the proper direction once he receives the call and allows himself to line up and just see what is happening in front of him. The mental part, Cooper is fine, but it is now the physical part. We have to make sure the durability factor – he has to be durable for us because he has missed the past two seasons. Mentally, I am not concerned about him. Physically hoping that he will be able to step up and be durable for us. Q: How much has it hurt Nat Berhe not being able to get on the field? A: That hurts tremendously because all the reps that Cooper and Landon and Mykkele [Thompson] and some of the other guys have taken, Nat would have been right in there with all the other guys. By him standing on the sideline and taking mental reps – I understand you are taking mental reps, but it is different. It is not the same as putting your body through the motions and making your body react to different movements that the receivers are stemming at you. It is going to definitely hurt him and set him back a little bit, but hopefully he can come back at training camp and be ready to fight for a starting job. Q: How is Mykkele Thompson coming along? A: Mykkele, I knew was a smart kid. He came here and he is a cerebral kid, that is for sure. He is going to take what I say literally and take my word for it and go out and try to execute it. Now I am starting to see that the kid actually has some football awareness, where I didn’t think he had much of it when we first started off. The [missed alignments] that started at the beginning of rookie mini-camp and OTAs have drastically gone down. Mentally, he has excelled past my expectations. Q: Are you eager to see how he holds up physically? A: Absolutely. Long arms. We did a drill the other day where he was having to punch a bag and escape from the blocker and to see his arms and the extension of his arms, that was good to see. I am definitely interested to see him in the pads. Q: How has Bennett Jackson handled the moved from corner to safety? A: It has been good. You are going from the outside where you are playing on an island and then all of sudden, you go to a back end position where you have to see the formation and play, the moving parts, and put people in the right position. Jackson, in his situation right now, there has been a learning curve for him, which has been hard for him. It has been a struggle at first, but out of all the guys, that is one kid that when he puts his foot in the ground, he can go. He can go. I am looking forward to seeing Bennett at camp with pads on because I truly believe he will hit as well. Q: Has anyone else caught your eye here in the spring? A: To be honest, the guys that you just named are the ones that I am focusing on. Justin Currie has done a great job, as well, our free agent. Big kid, as well. I am interested to see what he can do once the pads are on his shoulders and hopefully he will be able to be a thumper for us. Those are our crew. Those are our guys. Q: Have you seen enough from Dwayne Harris to get an idea of how he is going to fit for you? A: I had really a good idea before he came in, having faced him for so many years. He has done a nice job assimilating himself and getting the returns down, so we have seen enough, we are pleased. Q: Do you envision returning kicks and punts being his primary duty? A: He is going to be a ‘big four’ player, so he will be on all four of the teams and he will make a very good contribution. His coverage skills are equal to his return skills, so that is the nice thing about getting this kind of player. Q: Do you feel that you have a little deeper of a candidate pool for the return jobs? A: Well, we always want a deep pool because you know at any time one of those guys can get hurt and we need to put someone else in, so we are always trying to develop depth. Q: Any of the young guys in particular jumping out at you? A: As far as coverage guys or return guys? A: Odell has caught punts before but hasn’t done much the last couple of weeks. Edwards, an undrafted player, is starting to make some strides, but we will see once the pads come on and when we go in preseason games. Q: What do you see from Corey Washington? A: We just need him to get better so he can contribute on all four. Right now he is a two-team player but we would like to see him on all four so you maximize that roster space and that if he is dressed on game day. Q: Are the two you are talking about the return games? A: Yeah, he has primarily been on punt return and kick off return. We would like to develop some of his coverage skills on punt and kickoff. Q: Still the middle of June, but how do you feel about your overall group? A: I feel good about them right now. We got some new acquisitions at the linebacker spot and we got some safeties in, which are nice, and getting Bennett Jackson back has been pleasing. The young kid from Texas, Thompson, has done some good things; he is long and has real good speed, so I think he can be pretty versatile for us. Obviously Landon (Collins) has done a nice job in what he have asked him to do, so [I] am pleased with the overall group. Q: With the change in the extra point kick, will that change the way the kickers are going to be working in training camp? A: We have always done it. We had two games with it in the preseason last year, so we are well versed in it. We start them at the 15 and then move back from there. It is something that we are used to and it will not be a problem at all. Q: This isn’t something the linemen seem to excited about. Do you sense that at all? A: The field goal protection, there are some violent hits that occur. The ante will be raised with the rule and the way that it is written. Points are points, so the guys will be eager to get out there and to get points. For a team that has not fired its head coach since January 2004, there has been a tremendous amount of assistant coach turnover on the New York Giants the last two offseasons. In 2014, the team “retired” their offensive coordinator and fired their running backs and tight ends coaches. The quarterbacks coach was “demoted” to wide receivers coach and the wide receivers coach was “demoted” to tight ends coach. In 2015, the Giants fired their defensive coordinator and cornerbacks coach. The quarterbacks coach also left to pursue an opportunity in the collegiate ranks. In short, the only coaching positions that have not changed in the last two offeasons are head coach, offensive line coach, defensive line coach, linebackers coach, safeties coach, and special teams coordinator. The amount of overall turnover in a two-year period has been remarkable. Regardless if these coaches are old or new, all are now vulnerable on a team that has missed the playoffs three straight seasons. If the Giants miss the playoffs in 2015, with a schedule that includes only three playoff teams from 2014, there is a good chance the entire staff will be terminated. But let’s assume the Giants show enough progress to improve their overall record to 9-7 but miss the playoffs for a fourth season? Might John Mara and Jerry Reese retain Tom Coughlin and most of the staff for one more chance in 2016? It’s possible. And it’s also possible that they will only do so if other assistant coaches are let go. In my opinion, there are three coaches on this team who are vulnerable to being released if their respective units do not improve. Each of these units have been very inconsistent in recent years, but the organization has dedicated a tremendous amount of personnel resources into improving the units. Now the pressure is on the coaches to turn these assets into improved results. If you believe there is no way the entire coaching staff is retained if the team does not make the playoffs, then the work of these three coaches could prove decisive in the team’s overall success. Tom Quinn has been the special teams coach of the New York Giants since 2007. Quinn probably gets more grief than he deserves from fans as his special teams did play an integral role in two NFL Championship runs in 2007 and 2011. In many of the playoff games, special teams were a critical factor in the victories. His units have also performed reasonably well in certain areas when given the tools. That said, special teams has far too often been the Achilles’ heel of the New York Giants. In the last five seasons, the Giants have finished the regular-season 31st, 20th, 6th, 27th, and 17th in kick return average with only one kick return resulting in a touchdown. They have also finished 31st, 29th, 30th, 26th, and 19th in punt return average with no punt return touchdowns during that five-year span. David Wilson’s tremendous success as a kick returner in 2012 was the lone bright spot in the return game despite the fact the team has drafted prospects and signed free agents who were supposedly good return men. As the stats show, the Giants’ punt return game in particular has been anemic for a long time. In terms of covering kickoffs, the Giants have finished 4th, 11th, 16th, 9th, and 2nd in the NFL with no kick return touchdowns allowed. In covering punts, the team finished 31st, 17th, 15th, 30th, and 27th with six punt return touchdowns allowed. In other words, kickoff coverage has been satisfactory but punt coverage has been dreadful and very costly at times. During the last five years, the Giants have blocked two punts and have had two punts blocked. The kicking/punting game with Lawrence Tynes/Josh Brown and Steve Weatherford has been solid. When taken as a whole, the special teams have been below average. Among fans, Quinn is the least popular coach on the team. 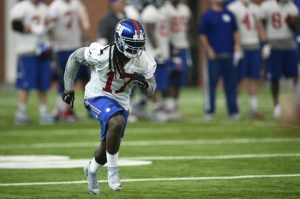 The team has dedicated a number of assets to Quinn this offseason, highlighted by Dwayne Harris, arguably the best all-around special teams player in the game. Harris not only returns punts and kicks, he also excels at covering punts and kicks. Harris was 2nd, 3rd, and 9th in the NFL in punt returns the last three seasons, with two scores. He was also also 2nd and 13th in the NFL in kickoff returns the last two seasons. Harris has been named “NFC Special Teams Player of the Week” three times. He was given an unprecedented 5-year, $17.5 million contract for a special teams player. But the reinforcements don’t end with Harris. The Giants also signed special teams standout linebackers J.T. Thomas (3 years, $10 million) and Jonathan Casillas (3 years, $8 million) as well as re-signing linebacker Mark Herzlich (2 years, $2.6 million). Draft pick safeties Landon Collins and Mykkele Thompson excelled on special teams in college. The Giants project another draft pick, wideout Geremy Davis, as another special teams asset. And defensive ends Damontre Moore and Owamagbe Odighizuwa; linebacker Devon Kennard; cornerbacks Mike Harris and Chykie Brown; and safeties Nat Berhe, Cooper Taylor and Bennett Jackson should all be core special teamers. Quinn should be out of excuses. He has a returner, kickers, blockers, and gunners. Pat Flaherty has been the offensive line coach of the New York Giants ever since Tom Coughlin became the team’s head coach in 2004. Flaherty helped to construct one of the great offensive lines in team history: left tackle David Diehl, left guard Rich Seubert, center Shaun O’Hara, right guard Chris Snee, and right tackle Kareem McKenzie. This group peaked in 2008 when the Giants led the NFL in rushing. Since then, the line has had its moments but it has declined steadily despite a second NFL title in 2011. The main problem is that the Giants have not done a good job of adequately replacing the five old foundation members – all of whom are now out of football. They got some solid play out of guard Kevin Boothe and center David Baas, but not much else (and both of those two players are now gone too). The Giants have drafted a number of offensive linemen who have not performed well for the franchise, including Guy Whimper (4th round), Mitch Petrus (5th round), James Brewer (4th round), Brandon Mosley (4th round), Matt McCants (6th round), and Eric Herman (7th round). They also signed some veteran free agents last offseason who did not pan out: center J.D. Walton, guard John Jerry, and tackle Charles Brown. Is the lack of development of these players the responsibility of Flaherty? Most likely not, but the team has spent resources to attempt to fix a sore spot that remains a sore spot. That does not help Flaherty’s case. The Giants were tied for 28th in the NFL last season in yards per rush. And while the Giants were 9th best in the NFL in sacks allowed with 30, that stat is misleading as Eli Manning was hit far too often in a West Coast offensive scheme based on a 3-step drop and a quarterback who historically does not take a lot of sacks. The current Giants offensive line now has two first round draft picks (Ereck Flowers and Justin Pugh), two second round draft picks (Will Beatty and Weston Richburg), and one very expensive free agent acquisition (Geoff Schwartz, 4 years, $16.8 million). The expectation is that not only should the line no longer be one of the worst in the NFL, but it should develop into one of the league’s best. The pressure is on Flaherty for these pricey investments to perform. 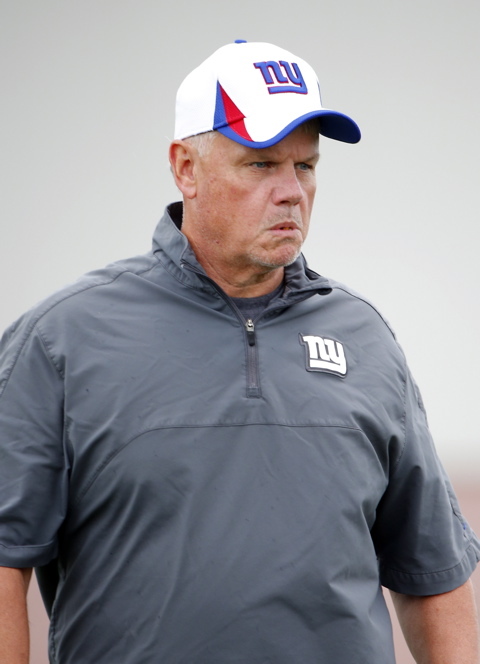 Robert Nunn has been the defensive line coach of the New York Giants since 2010 when Mike Waufle was fired. His lines have risen and fallen depending on the inconsistent performances of ends Jason Pierre-Paul, Justin Tuck, Osi Umenyiora, and Mathias Kiwanuka, and steadier performances from tackles Barry Cofield, Linval Joseph, and Chris Canty. In 2014, New York’s run defense was dreadful…dead last in the NFL in terms of yards per rush allowed. Like Flaherty, a strong argument can be made that the coach has not had much to work with as the key older players have left the team. Gone are Michael Strahan, Tuck, Umenyiora, Kiwanuka, Canty, Cofield, and Joseph. The Giants have not adequately replaced these parts. But in the last two offseasons, significant assets have once again been focused on the line. The team has placed the franchise tag ($14.8 million) on Pierre-Paul. It has spent high draft picks on tackles Johnathan Hankins (2nd round) and Jay Bromley (3rd round) and ends Damontre Moore (3rd round) and Owamagbe Odighizuwa (3rd round). Free agent ends Robert Ayers and George Selvie and tackle Kenrick Ellis have been signed. The expectation is that once again the defensive line will become the foundation of Steve Spagnuolo’s defense. The pressure is on for this unit to perform at a high level. It should be no revelation that two of the coaches in the hot seat are the line coaches. For the decline of the fortunes of the New York Giants since 2011 can be directly traced to the demise of the offensive and defensive lines. The Giants have been getting out-played up front. They have had problems running the football and defending the run. Pass rush and pass protection have been far too inconsistent. The franchise has dedicated a lot of resources to fix these problems. The outcome of the 2015 season will depend on how the lines perform. Despite some playoff heroics, special teams has been a sore spot for years. Yet somehow Tom Quinn has avoided the executioner. The excuses to retain his services are running out. 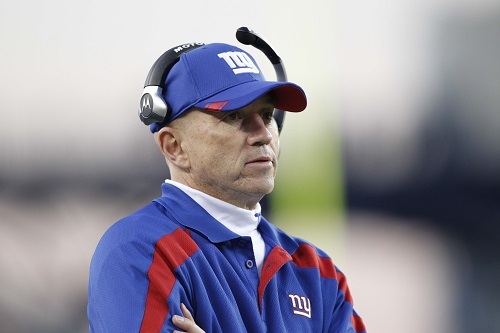 Ironically, Tom Coughlin’s fate may rest with Quinn. One or two games each year are won or lost because of special teams. Those one or two games could mean the difference between a playoff run or sitting home for the fourth time in a row in January. With the New York Giants reporting to camp in less than two weeks, BigBlueInteractive.com is breaking down each of the team’s positional groups from now until July 21. Today, let’s take a look at this year’s defensive line. 2013 YEAR IN REVIEW: The 2013 defensive line performed adequately, helping the New York Giants finish 8th in total defense (10th against the pass and 14th against the run). But those figures may have been inflated by the Giants facing some incredibly poor quarterbacks/passing offenses. The chief problem for the Giants was their best player up front, Jason Pierre-Paul, had his second subpar season in a row. Pierre-Paul had surgery in June 2013 to repair a herniated disc in his lower back and he never seemed to fully rebound from that procedure. He flashed some of his old form in Week 10 but also suffered a shoulder injury in that game which caused him to miss the last five games of the season. He finished 2013 with only 27 tackles and 2 sacks in 11 games. Statistically, the most productive player was Justin Tuck, who rebounded with a strong season (63 tackles, 11 sacks, 1 interception, and 2 forced fumbles) after two down seasons in a row. Mathias Kiwanuka played in all 16 games, with 10 starts at right defensive end. He finished the season with 41 tackles, 6 sacks, and 2 forced fumbles. Damontre Moore was drafted in the 3rd round of the 2013 NFL Draft. However, an early preseason shoulder injury disrupted his development, and while Moore flashed on special teams, he did not make much noise at defensive end when given a limited number of snaps. The Giants were pretty stout inside with Linval Joseph (59 tackles, 3 sacks, and 1 forced fumble) and Cullen Jenkins (31 tackles, 5 sacks, and 2 forced fumbles). Backing them up were Mike Patterson (23 tackles), Shaun Rogers (9 tackles), Johnathan Hankins (16 tackles), and Markus Kuhn (1 tackle). Rogers started two games but was placed on Injured Reserve in November in a move that appeared to be designed to give Hankins more snaps as well as keep Kuhn, who had been on the PUP recovering from an ACL tear he suffered in 2012. Overall, the slow-but-sure aging and departure of past stalwarts such as Michael Strahan, Osi Umenyiora, and Justin Tuck – combined with two down season by JPP – has largely taken the bite out of the once-formidable outside pass rush. Tuck had 11 sacks in 2013, but six of those came against the Redskins. The other ends combined for only eight sacks on the season while the tackles chipped in with only eight as a unit. ADDITIONS/SUBTRACTIONS: The Giants did not show much interest in re-signing 31-year old Justin Tuck and he is now in Oakland. Gone too is the Giants best defensive tackle of the last couple of seasons, Linval Joseph, who signed a big contract with the Minnesota Vikings. Again, it did not appear that the Giants made much of an effort to re-sign him. The Giants also did not choose to re-sign Shaun Rogers, who remains an unrestricted free agent. The main additions are DE Robert Ayers (UFA from Denver Broncos) and DT Jay Bromley (3rd round draft pick). The Giants also have brought in rookie free agents ends Kerry Wynn, Emmanuel Dieke, and Jordan Stanton as well as tackle Kelcy Quarles. Practice Squad DE Kendrick Adams, who has spent time with the Jaguars, Buccaneers, Lions, Browns, and Bengals, was re-signed. DT Everett Dawkins, who has spent time with the Vikings, Cowboys, and Buccaneers, was added as street free agent in June 2014. 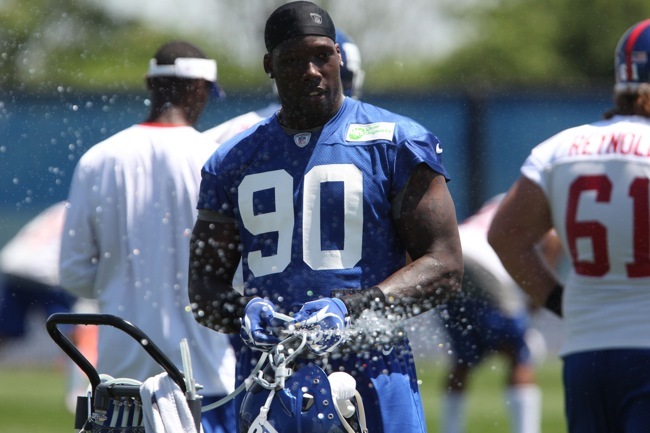 TRAINING CAMP STORY LINES: Will Jason Pierre-Paul regain his 2011 form? 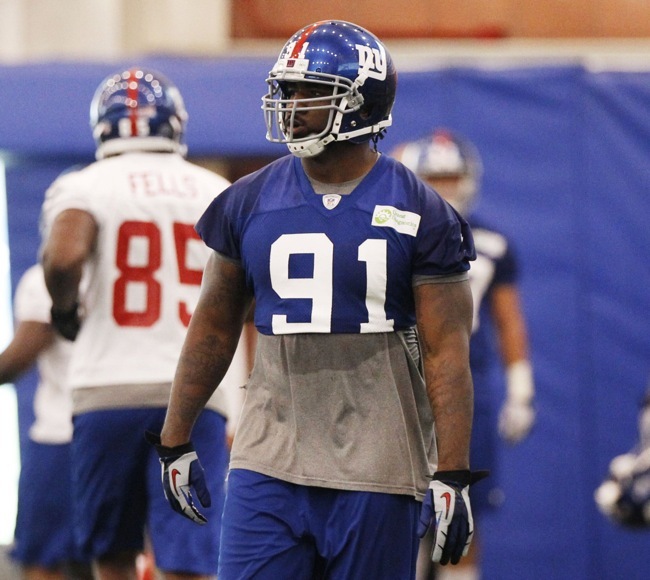 Who will start opposite of him – Mathias Kiwanuka, Robert Ayers, or Damontre Moore? Who will start at defensive tackle with Cullen Jenkins? 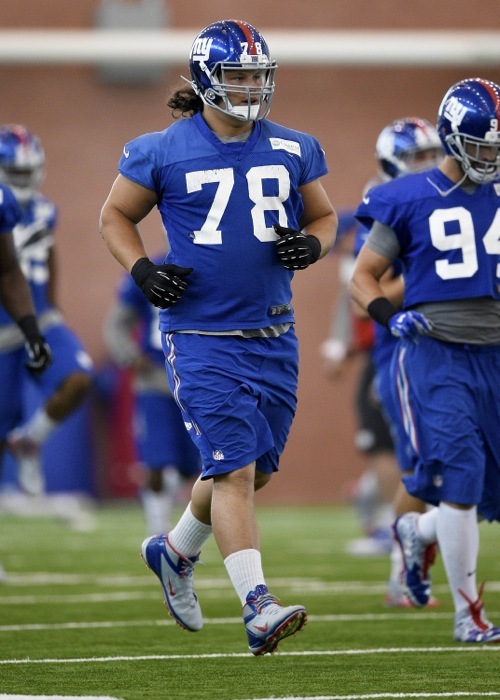 How many defensive tackles will the Giants keep? ON THE BUBBLE: Barring injury, it would seem that JPP, Kiwanuka, Ayers, and Moore are locks to be the four defensive ends. Jenkins, Hankins, and Bromley are probably sure bets at tackle. Do the Giants keep four or five tackles? It could come down to a serious battle between Markus Kuhn and Mike Patterson. Eric Kennedy – The Giants will have problems rushing the quarterback. Unless Kiwanuka, Ayers, or Moore can get to the passer on a consistent basis, Jason Pierre-Paul may be in for a rough season. Without a viable threat opposite of him, JPP will be the focal point of other teams’ blocking schemes. Kiwanuka and Ayers have flashed throughout their veteran careers, but they have yet to become (and may never become) guys who the other teams really worry about. To be frank, when Moore played DE last year, he didn’t look good. Perhaps he will show more now that he is healthier and stronger. I think Hankins has the tools to be better than Linval Joseph and if the Giants can get another good, solid season out of Jenkins, they’ll be fine inside. I’d prefer to keep only four defensive tackles, but I think 2014 will be a redshirt season for Bromley and thus the Giants will be forced to keep both Patterson and Kuhn. Connor Hughes – For all the questions concerning the Giants’ roster heading into training camp, the regular season and beyond, I don’t believe any have as many unknowns as the defensive line. 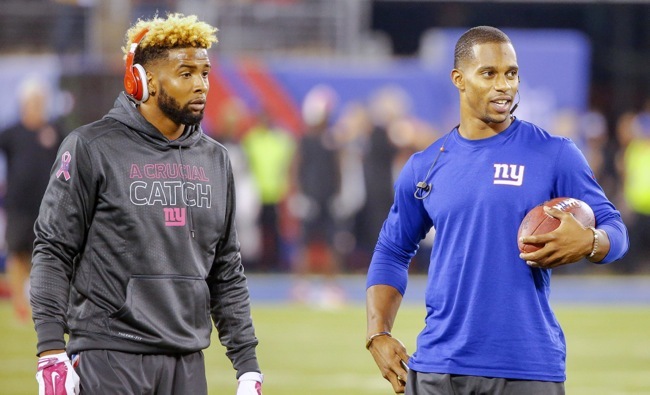 Throughout the course of the offseason, the Giants put their emphasis on the secondary. Gone were the days of loading up on pass rushers. Instead, the team signed and signed again big-name and high profile defenders in the secondary. I agree with the change in philosophy, but I have very little faith in those up front. Mathias Kiwanuka appears to be in the tail end of his career, who knows what JPP will take the field (if he even gets on it), Cullen Jenkins is older, Johnathan Hankins has yet to be an every-down player and Mike Patterson doesn’t have much ability outside stopping the run. Justin Tuck is in Oakland, Jay Bromley is a rookie. If one or two injuries hit the group…things could get ugly fast. Granted, things could go the complete other/positive way. Robert Ayers could excel in a new location, JPP could be the Pierre-Paul of 2011, Kiwanuka could revitalize his career, Hankins could be a force and maybe Bromley steps up. I’ve thought long and hard about the positives of the defensive line, and I’ve come up with a bunch, but for every one good there are two negatives. Who knows, maybe the secondary can mask the guys up front. That philosophy certainly worked in the reciprocal fashion over the last seven years. Eric Kennedy – Mathias Kiwanuka (LDE), Johnathan Hankins (LDT), Cullen Jenkins (RDT), and Jason Pierre-Paul (RDE). Reserves: Mike Patterson, Markus Kuhn, Jay Bromley, Robert Ayers, and Damontre Moore. Connor Hughes – Mathias Kiwanuka (LDE), Johnathan Hankins (LDT), Cullen Jenkins (RDT), Jason Pierre-Paul (RDE). Reserves: Mike Patterson, Markus Kuhn, Jay Bromley, Robert Ayers, and Damontre Moore.